Available Now! 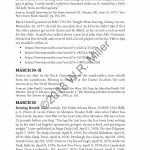 The Star Wars Historical Sourcebook! The Star Wars Historical Sourcebook: Questions! Star Wars Progress Report: Almost There! Mark Hamill and Stan Lee praise each other during a recording session for Marvel’s Avengers: Black Panther’s Quest. Watch: Marvel’s Avengers: Black Panther’s Quest is coming this fall to Disney XD. 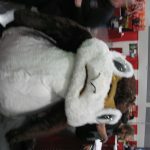 At Comic Con Revolution in Ontario, California on May 19, I was browsing the exhibition room when I was approached by a Porg. I could not resist. Resistance was futile. Yes, Screen Junkies has an Honest Trailer for Star Wars. Enjoy: Posted November 17, 2015. Darth Vader vs. Buzz Lightyear! What would happen if a certain Dark Lord of the Sith met a celebrated Space Ranger from Star Command? On February 1, 2017, “Nukazooka” uploaded such a confrontation on YouTube here: Enjoy!